After a long holiday, Virtual Console returned on Monday with Ufouria: The Saga. Legendary translator Victor Ireland has plans for more off-the-wall titles for Virtual Console, but first he needs to know they would sell, so he's appealling to VC lovers across North America. This is the one many of you have been asking for. If we get good sales of this one, I can keep pushing to get some of the other unreleased or hard to do stuff that you've been asking for out in North America. Want to see more oddball titles available for download? Pay a measly 600 Points for Ufouria and hope that enough people do the same to justify more translations. I would but I have no money... I need to hurry up and get some. I'd love to see more on VC. Yep this is a Great game! 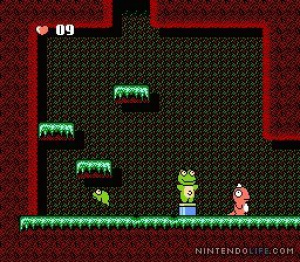 Fans of oldschool Platformers will love this. It's not too difficult and there's a nice variety of areas to explore. Quite alot of VC imports are among my favorites. Keep em coming! So would they be translating games that hadnt been previously translated? Well that settles it. I was on the fence about this title, but now I'm taking the plunge. To me this reads like the first acknowledgment that VC sales may not be strong enough to support the cost of creating these titles, at least the ones with significant production hurdles. I WILL NOT BE BULLIED INTO BUYING ANYTHING!! I'm going to report this to my guidance counselor! 'Cyber Bully"-ing is real and not something to be joked about. I agree with Ireland. Hand over your lunch money, manleycartoonist! If Ireland told you all to jump off a bridge to get Earthbound, would you? They already jumped long ago. Aye, look at all our broken bones! Is this the game that's like metroid? If it is then I will pick this up for sure. Nope. the VC must die once and for all! I downloaded this last night. Played for an hour 45, and it's really good! DEFINITELY worth $6, so everybody who hasn't yet done so much download it! Of course I'm for the expansion of the VC, but this game really doesn't look that good to me. I guess I can't judge it until I play it. Sadly, I must wait a week to purchase it. I have the points for it, but I won't have internet at my new place for a little while. @manleycartoonist: ...so if I drop you, we get EarthBound? .... and can this guy get us Atlus titles on VC? Nintendo 64 titles? I hope Mr. Gimmick gets released. I'll get it. Looks awesome. I got it last night. It's a really awesome game and definitely worth the 600 points. Already got it. Even if he weren't promising this I still would have gotten it, because it's good. Ok, Victor makes a good point. I said I wouldn't buy more VC/Wiiware games until I was done with my current backlog but I'll make an exception. Not get on with setting the publishing rights straight for Mr Gimmick! Hmmm... could they be hinting at EarthBound for NES? Wow is this what they resulted in telling people to buy games or they wont release VC games. What a joke I was thinking of pickng this one up but after that forget. If they wont put anything on VC than forget them. The VC is the main reason I bought the Wii before the Xbox 360. If thats how its going to be companies threatening commsumers to buy their product than I might as well just sell my Wii and stick with my 360. Nintendo is getting too greedy. It use to be that people would buy Nintendo products because of game library and their reputation, not cause the told people they have to or else. Hmmmmm maybe I should send a letter to Nintendo saying put out more VC games or I will sell my Wii and boycott their products. Wonder if that will work like they expect it to work on us. Well, I do want more VC games. I may have to break my resolve to buy more games until I have money too. Easy mode Metroid sounds about right for me. Not a high prioritly on my list, but I may get this sometime. THIS JUST IN, COMPANIES DO MORE OF WHAT SELLS WELL. While "cyber-bullying", manlycartoonist, may in itself be... bad... he's not forcing us to do anything. I'm getting the game because I WANT TO and have an affinity for little known, quirky, "good" games. Now, if he translates more due to enough of us buying this one, cool beans, and if not oh well, but don't try to cyber-bully everyone with your personal decision not to buy it... your request to everyone not to do it is no different than the gentleman asking us to do it... it's everyone's own choice. What translation is this guy talking about? Uforia was released originally in Europe and Australia, so the translation was already done! ....also, it still hurt alot, when do I get my EarthBound? Does this run at the same speed as the European version or is it as fast as the Japanese version? p.s. judging by your avatar, are you also a Michigander? Don't listen to lz! Buy Ufouria to keep VC alive and well! I will, just as soon as I get more points! You sir, are a hero. More VC games, please! Gimmick! (or maybe the unreleased Mr. Gimmick!) would be awesome. Aren't you just high and mighty Tides of Chaos... You know how many games European gamers have to play with PAL slowdown? I think us American gamers can deal with 1 games that's slightly sped up. That's a lot better than the game being slowed down. I'll buy anything that anybody on the internet tells me to. SOLD! That's somewhat misleading, as Ufouria was previously translated into English (with some graphical changes as well). I do hope Ufouria sells well regardless, as I'd love to see Sunsoft continue their support of the VC (and I'd also love to play an English translation of Albert Odyssey). For the record, I've bought Ufouria and I'm enjoying it immensely. Is there anything else that SunSoft could release that would be desirable? I'd only want WakuWaku 7 from them. Maybe Mr. Gimmick too. Most of their other games are licensed ones which would be hard/expensive to get but not completely impossible, just very unlikely. There is Firepower 2000 (aka Super SWIV) and Hebereke's Popoon that would be decent enough additions to the VC but I wouldn't be bothered if they never appeared. i bought it. pretty good game. I just finished the game. Having gone over some videos of the original version to compare, I can confirm first-hand that this is indeed the slower PAL version. GoNintendo didn't get it quite right...they didn't speed it up for our release, we just got the normal slow PAL version. That means we also got the slightly squished visuals. I'm somewhat disappointed by this...would it have been so hard to make the game run at 60hz? Still, the game is enjoyable in its own right. I would still recommend it overall. I've bought enough games with the false hope that my purchase will make more releases happen. I will no longer buy a VC game for that reason alone anymore. 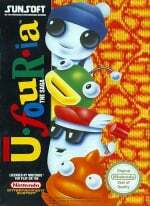 However, Ufouria does look interesting and I was unaware that it was an import game. Was it Europe only, or was it released in Japan at 60hz? #54: Work can be done on any VC game. But that work needs to be paid for which is taken out of the profits of selling the downloads. Plus, I assume that many publishers are happy with the product as it is and that any improving they did wouldn't necessarily make for more downloads hence it would be a waste of their time and money doing so, even though we the gamers who did download their games would have appreciated it. #55: There was a Japanese game which obviously run in 60hz but its in Japanese so they understandably released the english version. I know this wasn't translated but they implied that they'll do translations so does this mean theres a chance of seeing mother and tales of phantasia on vc. Downloaded it last night. Still haven't had a chance to play it. @Tasuki: I think they mean they'd like you to buy it as they want some profits from the game to release even more from their library, if you feel that they are being greedy (or the game doesn't look good to you) then don't pay for it. You are right though that they shouldn't plead to customers to add games though...it's a risky business move. Bit of a stretch to label one unofficial forum post on Sunsoft's own community forum as a plea for money. It's natural that Sunsoft would wait and see how much money they make (or potentially lose) from Ufouria before green-lighting games of similar background. Um... Sorry, Vic, but I don't want "quirky" titles; niche doesn't always mean good. I want the wall-banger-worthy titles that skipped out on America, like Terranigma. "Is there anything else that SunSoft could release that would be desirable?" 3 words: Journey to Silius! got it on Monday. awesome game! please release more. Bought. Victory will be ours!!!! VC shall rise from the dead and vengeance shall rain down upon all those that cross it and the VC will crush them as if they were nothing, engulfing them in flame to burn eternally in hell. Please. While I'm generally against unoptimization of games, the music/speedup issues from this game don't seem like much of a big deal. I think the music sounded fine from the video (probably because I never heard the original). The NES wasn't exactly the speediest of consoles, so I can't see being bothered by a little speed boost (slowed down PAL VC titles would tick me off though). In fact, I wouldn't be surprised if the speed is about the same as it was in the NTSC Japanese version, as the PAL version was probably poorly optimized and slowed down back in the day. I'm going to go with supporting VC as the lesser of two evils on this one. I don't want it to die! @Token Girl: It's not...it's really just the PAL version running at PAL speed. I have no idea where this report on "increased speed" came from, but it's complete and utter nonsense. A lot of people seem to think there's something wrong with a company wanting to actually do good enough business to be able to release more product. The way I see it, such a request is a way of showing that the company cares about what the gamers want, but can't do much if they don't fund the work. If a game doesn't sell, don't expect a sequel, or in VC's case, just another game from the same people at all. I, for one, would rather be told what the deal is than simply have no releases without ever knowing it was because nobody bought what was already there. Of course, I'm generally in favor of openness on the part of game companies, so ANY gesture of this sort feels like a breath of fresh air. Samuria Showdown 3 is out on the 3/9/2010 in the EU,its a class game,pitty they didnt release Samurai Showdown 1. Welcome back Vic! I'd love to see Bionic Commando. Sorry NOA, too little too late. I've moved on. It was nice knowing you. Two problems with that. First, Bionic Commando is Capcom's, not Sunsoft's, and second, Capcom tried to put the game on the Virtual Console once, but Nintendo said no because they took it as advertising for the Bionic Commando remake on XBox Live. Dude, I AM TRYING! I've been trying to start up the Wii Shop Channel ALL WEEK. Several times a day! And all I get are 051330 errors. AKA, "We at Nintendo have sh*tty servers. Just keep trying" errors. I stuffed my Wii with 30 bucks worth of points as soon as Sunsoft announced that Aero the Acrobat, Aero 2 and Ufouria would be coming in the summer. It took me a week to get into the shop and download Aero last time, and now I'm on track to wait AT LEAST THAT LONG to nab Ufouria. It's just extra stupid since I won't even have to buy more Wii points - all I need is, like, 20 seconds to get to the download and nab the game, and my money will be yours! But Nintendo has other plans it seems. Still, you can bet your - that in spite of Nintendo's incompetent digital storefront - I will do my best to support the crap out the games Gaijinworks/Sunsoft brings to the VC. I already picked up both Blaster Masters and Aero (which I really dug when I was a kid - thanks for getting that on the service!). And I really wanna see Journey to Silius and Mr.Gimmick on the service someday. So I'll keep trying until I can FINALLY download Ufouria! As long as it takes! Why do some people here think Vic Ireland is part of NOA? i've wasted nearly $200 on buying VC games I already own or have recently gotten in cartridge form in hopes of supporting for obscure releases and games that never came to NA (many games I re-bought in cart form because i was tired of releases being far too damn slow). Ufouria finally came out so im glad thats been released, but there are WAY too many yet to be released that i'm sure Nintendo will probably never bother with. For starters off the top of my head: Mr. Gimmick, Devil World, RodLand, Hammerin' Harry, Banana Prince, and Terranigma. Of course I know Vic Ireland can't get all of that done, but it would be nice to see Mr. Gimmick! for starters. I supported working designs when vic was with the company whom he brought us gems like popful mail, dragon force, magic knight rayearth, vay, etc. I'm glad he is one of the guys who appreciates games that are not known as much outside of japan and tries hard to give us the opportunity to play them. I'll gladly support all of sunsoft vc games. Now give me the valis series Vic and I will be one happy gamer. Huzzah! Finally got my Wii to connect to the internet and just downloaded Ufouria! Seems like a fun little game; nice to see a "happy" take on the Metroidvania style of gameplay. Its a little weird though - I only found out on accident that Bop Louie could stomp enemies, for example, which seems important. Who thought holding down during your jump was a good idea for that, huh? Glad to see it come out here finally. Oh and heck Mr.Ireland. I got some Wii points to kill (don't know WHY I ever thought pumping 30 bucks worth into the thing was a good idea. WEEKS go by without hardly anything worth downloading), so I can gift another copy of Ufouria to a friend and still have some virtual bucks left for whenever Aero the Acrobat 2 comes out. I'm doing my part. I just need to see ONE MORE WAVE of Sunsoft games hit and I'll be happy. Journey to Silius, Gimmick/Mr. Gimmick, and Waku Waku 7 -- which is ALREADY out in Japan for the VC -- would be great. But you could substitute Chameleon Twist 2 in there somewhere if you get the chance; some third party needs to put an N64 game up there sometime! Good luck making money with the overhead involved putting these games on the VC! I bought this game yesterday and I think that it's a pretty good game. Different, but I like it. Y'know what? Mr.Ireland, the effort is definitely appreciated but eff it. Nintendo's treatment of the service is borderline criminal. Hell, it's not even stable - constantly doling out errors despite every other wireless device connecting to networks effortlessly. Its horribly designed as well, and if they can't be bothered to radically update it - a "Dashboard Update", as Microsoft calls it - then why should you try? If they can't be bothered to maintain the thing, then you shouldn't care anymore. Just wait till their next console. 'cuz that's the only way I feel Nintendo will actually redo the Virtual Console/Wiiware digital storefront. Its embarrassing right now; for example, the lack of media for titles. Or rather, the trailers for games being over in the otherwise useless Nintendo Channel. How 'bout the lack of real awareness for standout titles? Or how hard it is to search for stuff now that there are so many games up there? Nintendo has BILLIONS of dollars to throw at this problem - to start an "online division" would be so easy for them, seriously -, yet they don't. They'd rather waste money on R&D for the damn vitality sensor, or whatever crappy "Wii ______" branded game they can throw out at the mainstream to make more money off of. Seriously, if they don't care, eff 'em, dude. Even when I go to download your stuff - and I've picked up Aero 1 AND Ufouria, and am waiting for Aero 2 so I can never again bother with the Wiiware/Virtual Console channels again -, half the time I just get errors. Its an obnoxious, amateurish digital storefront. Nintendo doesn't deserve your support, nor do they deserve ours. Hey I bought it tonight. Working Designs brought us some AWESOME games & packaging. I thought I was going to pass on this simple NES Metroid clone, but this is easy and (when you really think about it) friggin' weird! I love it. I'm so glad this is on the Virtual Console.